With the holidays just around the corner, people all across the United States are gearing up for hosting their parties for friends and family. This makes sense, of course, because this is the perfect time to get together and show the people you’re closest to some love. It’s also a wonderful opportunity to invite people over to a new home. As the best mortgage brokers in Scottsdale, we’ve helped quite a few people move into the home of their dreams this year. There’s a whole lot to love about getting to know a new living space, but is there a better way to break it in than by having your loved ones over for a time of celebration? We don’t think so. 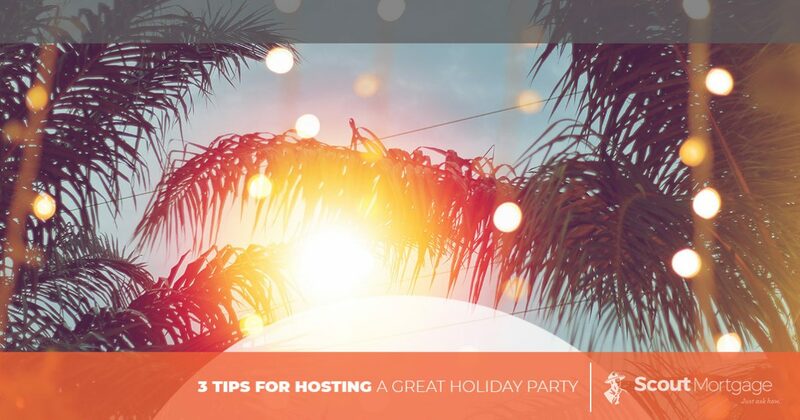 That’s why in today’s post we’ll be sharing a few of our favorite tips for how to host a great holiday party. Keep reading to learn more! Nothing sets the mood quite like good tunes. You know what the vibe of your get together should feel like, so set aside some time right now to put together a playlist. Whether the mood is calm and casual or upbeat and exciting is up to you entirely. Trust us when we say that some great music in the background is exactly what you need to keep your event moving along smoothly. All too often, people assume that their holiday parties need to be formal and extravagant. While you can certainly do that if you have a penchant for going big, our advice is to host a get together that is more casual in nature. It will be easier for you to plan and less intimidating for your guests to prepare for, and at the end of the day, isn’t one of your goals to host a party that people actually enjoy themselves at? Once again, your inclination might be to cook to impress. There’s nothing wrong with that, and if that’s the route you go, be sure that you have plenty of time to make sure you get everything just right. On the other hand, why not go a little more low key this time around? At the end of the day, people are going to enjoy good conversations with the people they love, so does it really matter if you order pizzas from your favorite local place rather than making your own food? If you’re in need of a mortgage broker, look no further. We take great pride in helping people to get into the homes they have always dreamed about having. No matter what that looks like for you, if your goal is to buy a home in Scottsdale or the surrounding area, we’d love to help. With dedicated mortgage specialists, we can walk you through the entire process step by step, taking something complicated and making it easy to understand. It doesn’t get much better than that! Contact us today to get the process started.